Glen Lyon is little known, and less visited, and it is only when you seek it out on a map that you begin to realise just how significant a presence it is in the central highlands. 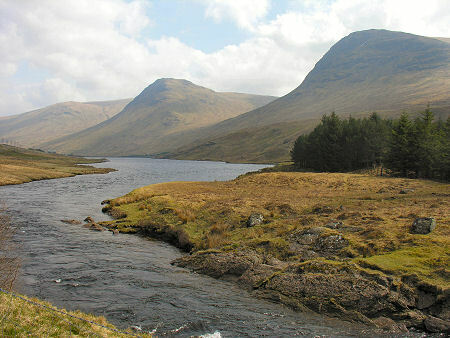 The glen extends for some 25 miles from the pretty village of Fortingall in the east to the head of Loch Lyon in the west. 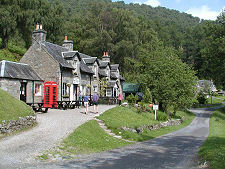 This page assumes that you start your exploration of Glen Lyon in Fortingall, which is home to some highly unusual thatched cottages, an excellent hotel, an attractive church, and the ancient Fortingall Yew, believed to be 5,000 years old and quite possibly the oldest living thing on earth. 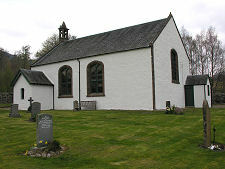 It has also been claimed that Fortingall was the birthplace of Pontius Pilate. 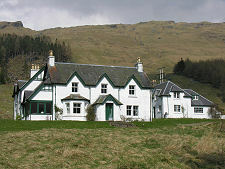 At the west end of the village of Fortingall is Glenlyon House, parts of which date back to 1694. A little to its west, the River Lyon emerges from the steep sided rocky jaws of Glen Lyon itself. The road through the glen is single track throughout, though the first two miles through the glen are the most demanding as the road follows the twists and turns of the fast flowing and tightly confined river. Thereafter the glen opens out and sight lines on the road improve, and the further west you go the more open it becomes. You also tend to find that the further west you go the less traffic you encounter. As the glen begins to open out, keep a lookout for the arch of a packhorse bridge crossing a tributary below a waterfall on the south bank of the River Lyon. This is locally known as the Roman Bridge, though actually seems to date back to the 1600s or 1700s. 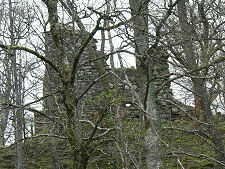 A little further on, and equally elusive if you are not observant, are the ruins of Carnbane Castle. 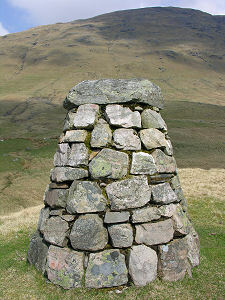 These stand on top of a spur of high ground on the north side of the river above the road. The castle seems to have been a fortified hall-house dating back to the 1500s. It was built by Red Duncan Campbell the Hospitable, who was not quite so hospitable that he overlooked the inclusion of gunloops in the design. The castle was burned down during a raid by cattle thieves, and has stood as a ruin ever since. The tiny hamlet of Invervar is best known as the starting point for the walk round the "Glen Lyon Horseshoe", a circuit of four Munros, or individual mountains over 3,000ft high, to the north: Carn Gorm, Meall Garbh, Carn Mairg and Meall na Aighean. Assuming you are driving rather than hillwalking, the next highlight along the glen is St Adamnan's Cross (or St Adomnán's Cross) on top of an embankment on the left hand side of the road just before you reach the farmstead at Camusvrachan. This is a stone which leans over to one side and carries a cross on two faces. It is named after Adomnán, Abbot of Iona from 679 to 704. 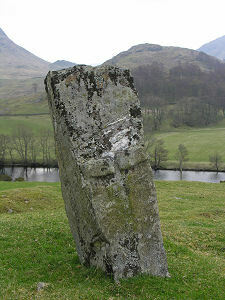 There are suggestions that Adomnán visited Glen Lyon on a number of occasions en route from Iona to Pictish Atholl, and the cross is one of a number of objects named after or dedicated to him in the area. In Glenlyon Church at Innerwick, you can see another, St Adomnán's Bell, believed to date back to the 700s and found in the churchyard of the ruined St Brandon's Chapel in the glen. 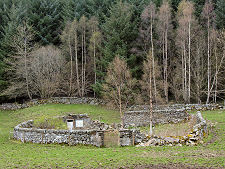 Not far from Glenlyon Church is the Glen Lyon War Memorial, next to the road. 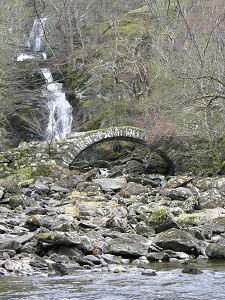 A little further is Bridge of Balgie, home to the glen's post office and a tea room, as well as a gallery. From Bridge of Balgie an adventurous single track road provides an alternative route into or out of the glen as it climbs to a height of 1,800ft over the flank of Ben Lawers before descending to Loch Tay, east of Killin. This minor road is not kept open in winter conditions. If you continue along Glen Lyon, you find it becomes much more open west of Bridge of Balgie. It is worth looking out for the spectacularly white Meggernie Castle, close to the river south of the road: but you only catch a brief glimpse from the main road and closer approaches are deterred by "private" signs. 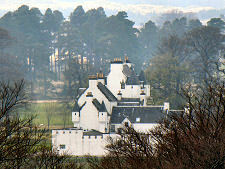 Meggernie Castle was the traditional home of the Campbells of Glen Lyon, and lairds included Captain Robert Campbell, who led the government troops who committed the Glencoe Massacre. 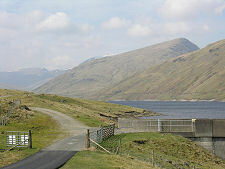 A branch in the road beyond Meggernie Castle allows you to turn north west towards Loch an Diamh and its surrounding Munros, including Meall Buidhe. The alternative is to press on into the ever wider spaces of the western end of Glen Lyon. 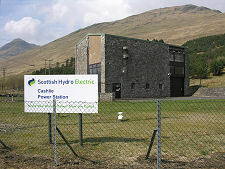 En route you pass power stations at Stronuich and Cashlie and the remains of a series of homesteads. A cairn on a hill to the right of the road remembers (a different) Robert Campbell, noted for his exploration of north west Canada. 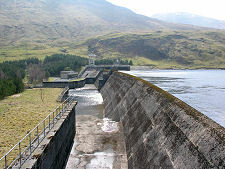 As you approach Pubil and Lubreoch, the glen is increasingly dominated by the massive Lubreoch Dam, whose construction in the 1950s created the five mile long Loch Lyon as part of a wider hydro-electric scheme. 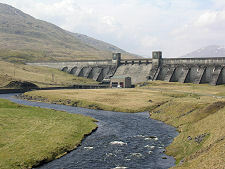 The head of Glen Lyon is an intriguing place, with the far end of the loch being only four miles from Bridge of Orchy and the West Highland Railway. When we first produced this page we noted that, apart from the road south from Bridge of Balgie, Glen Lyon was a cul de sac. Most maps continue to show it as such, but it is worth knowing that there is a single track tarmac road leading south from Lubreoch at the east end of Loch Lyon to the head of Glen Lochay. This is apparently open for public use, though reports we received from Dougie Beck and Carrie Rice in 2012 suggested it was very potholed and breaking up badly in places. 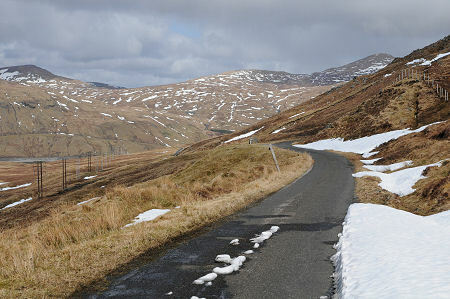 After a further winter, Craig Strachan reported that the road was almost impassible by May 2013. In April 2016 Ky & Sean Thomasson-Kay reported that "'Road' is a very loose term for what it is now. We got out and put stones into some of the potholes for chassis clearance in a couple of sections. It took me back to being a boy of my son's age now of 12 and driving up and over the Hajar mountains separating Dubai and Oman's northernmost territories. " The road climbs to a high point of nearly 1,700ft and is certainly very unlikely to be passable in winter conditions.